New love for Darren Clarke? The Belfast Telegraph reports that Darren Clarke has been seeing the former beauty queen and model agency boss Alison Campbell. The world’s toughest jobs include occupations such as salt miner, killer bee remover and alligator wrangler. Until the second round of the US PGA Championship at Southern Hills, they also included Billy Foster’s role as caddie to the tempestuous Darren Clarke. Graeme McDowell has set his sights on securing his Masters invitation before Christmas after a six-under 66 gave him a share the lead with US PGA champion Y.E. Yang going into the final round of the US$5.75 million Chevron World Challenge in California. The pair lead by a shot on 10 under par from Padraig Harrington and Lee Westwood and world No 55 McDowell knows he has a golden opportunity to take full advantage of his late invitation to replace the beleaguered host Tiger Woods at Sherwood Country Club in Thousand Oaks. "Obviously, a huge blow for the tournament not to have Tiger here," McDowell said. "I feel very fortunate to receive the invite. It was a great opportunity for me." 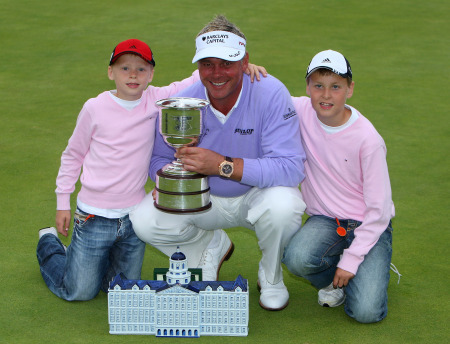 Darren Clarke is set to leave London for good and set up home in his native Northern Ireland. Darren Clarke is to remarry, giving Graeme McDowell yet another “win” this year. McDowell set his fellow Ulsterman up on a blind date with former beauty queen Alison Campbell. Result.